Response to Intervention (RtI) has been described in Florida as a multi-tiered system of supports (MTSS) for providing high quality instruction and intervention matched to student needs using learning rate over time and level of performance to inform instructional decisions. MTSS is a framework to ensure successful education outcomes for ALL students by using a data-based problem solving process to provide, and evaluate the effectiveness of multiple tiers of integrated academic, behavior, and social-emotional instruction/intervention supports matched to student need in alignment with educational standards. Within the MTSS, resources are allocated in direct proportion to student needs. Data collected at each tier are used to measure the efficacy of the supports so that meaningful decisions can be made about which instruction and interventions should be maintained and layered. The MTSS involves the systematic use of multi-source assessment data to most efficiently allocate resources in order to improve learning for all students, through integrated academic and behavioral supports. To ensure efficient use of resources, schools begin with the identification of trends and patterns using school-wide and grade-level data. Students who need instructional intervention beyond what is provided universally for positive behavior or academic content areas are provided with targeted, supplemental interventions delivered individually or in small groups at increasing levels of intensity. 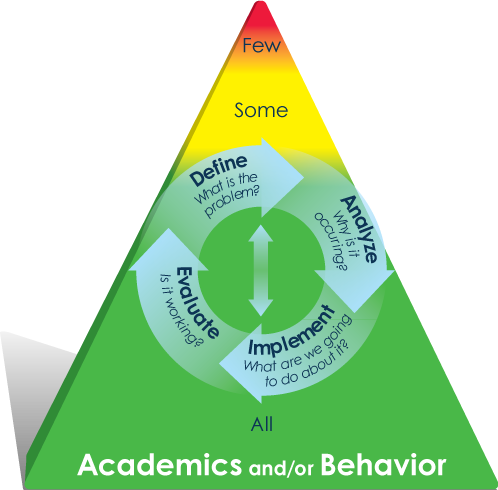 The MTSS is characterized by a continuum of integrated academic and behavior supports reflecting the need for students to have fluid access to instruction and supports of varying intensity levels.Three tiers describe the level and intensity of the instruction/interventions provided across the continuum. Tier 1 - Core Universal Instruction and Supports: General academic and behavior instruction and support designed and differentiated for all students in all settings. Tier 2 - Targeted Supplemental Interventions and Supports: More focused, targeted instruction/intervention and supplemental support in addition to and aligned with the core academic and behavior curriculum and instruction. Tier 3 - Intensive Individualized Interventions and Supports: More focused, targeted instruction/intervention and supplemental support in addition to and aligned with the core academic and behavior curriculum and instruction. *The three tiers are not used to describe categories of students, timelines, procedures, or specific programs. Introductory Video for Parents: This video for parents introduces parents to the use of problem-solving and how it may affect their child in the context of school-wide implementation of a multi-tiered system of supports, often still referred to as RtI. If you would like additional information on MTSS please use the links below.